During the last decade of the 20th century, Africa has been marked by a "constitutional wind" which has blown across the continent giving impetus to constitutional reforms designed to introduce constitutionalism and good governance. One of the main features of these processes has been the promotion of public participation, encouraged by both civil society and the international community. 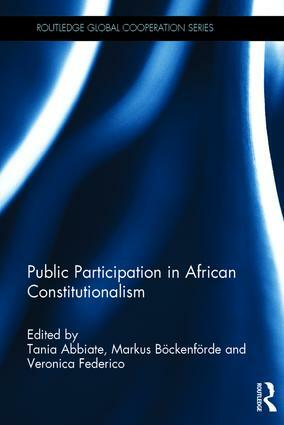 This book aims to provide a systematic overview of participation forms and mechanisms across Africa, and a critical understanding of the impact of public participation in constitution-making processes, digging beneath the rhetoric of public participation as being at the heart of any successful transition towards democracy and constitutionalism. Using case studies from Central African Republic, Egypt, Kenya, Libya, Malawi, Morocco, Senegal, Somalia, South Africa, South Sudan, Tanzania, Tunisia, Zambia and Zimbabwe, the book investigates various aspects of participatory constitution making: from conception, to processes, and specific contents that trigger ambivalent dynamics in such processes. The abstract glorification of public participation is questioned as theoretical and empirical perspectives are used to explain what public participation does in concrete terms and to identify what lessons might be drawn from those experiences. This is a valuable resource for academics, researchers and students with an interest in politics and constitution building in Africa, as well as experts working in national offices, international organizations or in national and international NGOs. PART III: Participation in context: does it make a difference? Tania Abbiate is a Senior Researcher at the Max Planck Institute for Social Law and Social Policy, Germany. Markus Böckenförde is Executive Director and Senior Researcher at the Centre for Global Cooperation Research, Duisburg, Germany, and a Visiting Professor at the Central European University (CEU), Budapest, Hungary. Veronica Federico is Researcher of Comparative Public Law in the Department of Legal Studies at the University of Florence, Italy.